Developer Milestone S.r.l. certainly works hard to keep motorcycle racing fans happy. They’ve already released a trio of two-wheeled racers this year (Monster Energy Supercross, MotoGP 18, and MXGP Pro) and now they’re topping off their very busy year with Ride 3. I’m pretty sure Milestone employees see Hondas and Ducatis every time they close their eyes. The Ride series is arguably Milestone’s crown jewel – the Italian studio’s ultimate ode to motorcycle racing. Past entries in the series haven’t quite delivered on the “Gran Turismo, but for motorbikes” promise, but Ride 3 might, er, break the cycle. The game has been rebuilt from the ground up using Unreal Engine 4 and includes a revamped career mode, livery editor, and other new features. So, is Ride 3 the decadent celebration of moto racing fans have been waiting for, or is Milestone spinning its wheels? Ride 3 isn’t the most demanding racing game on the market, but it’s a far cry from Road Redemption. This is a sim, albeit a relatively welcoming one, and victory requires precise use of the brake button to cut just the right line around corners. Play recklessly, and your bike will end up somewhere in the stands. Thankfully, Ride 3 comes with a number of tutorials and most should get the hang of cornering eventually. While I don’t have any real-life motorcycle riding experience, I would say Ride 3’s physics feel pretty solid, although bikes don’t quite have the weight or feeling of power I’d expect. Individual bikes also don’t feel as unique as they should. Sure, bikes from completely different categories feel different – a sports bike feels different than a supermoto one – but vehicles of the same type and class generally ride fairly similarly. Ride 3’s crash physics also seem a bit wonky, with your rider often valiantly holding on as multiple opponents careen into them, only to go sprawling when you accidentally brush against a patch of grass. Of course, real-life moto racing also has its share of “random” elements and mishaps. Thankfully, the Ride series employs a rewind system that’s a godsend for anybody who’s not a sim racing savant. At any time the game lets you rewind about 10 seconds of race time, allowing you to correct a bungled turn or avoid that aggressive opponent who just ran you off the track. Aside from not being able to use it for time trials, there’s no real penalty for rewinding, allowing you to essentially craft a victory turn by turn. That may not be everyone’s cup of tea, but it’s nice that the option is there. 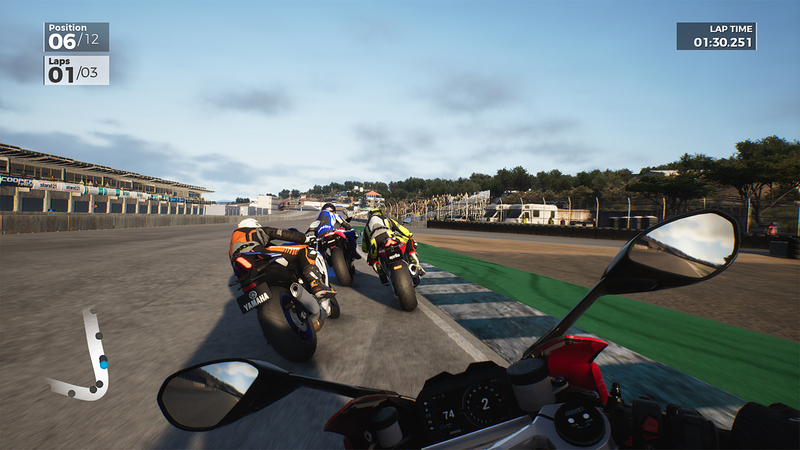 Really, Ride 3 is surprisingly accessible for a racing sim – the game provides a wide array of difficulty settings, allowing players to adjust opponent AI, ideal trajectory guides, braking and steering assistance, and more. As with the rewind feature, you’re not punished for toning down the difficulty. You do get cash bonuses for kicking things up a notch, which is a smart bit of balancing. Nobody is locked out of any of Ride 3’s content, but skilled players can buy new bikes quicker. This is a relatively-attractive game by Milestone standards. Nothing in Ride 3 is particularly cutting edge, but the game looks sharp and runs at a nice, consistent clip (a full 60fps on PC, PS4 Pro, and Xbox One X). 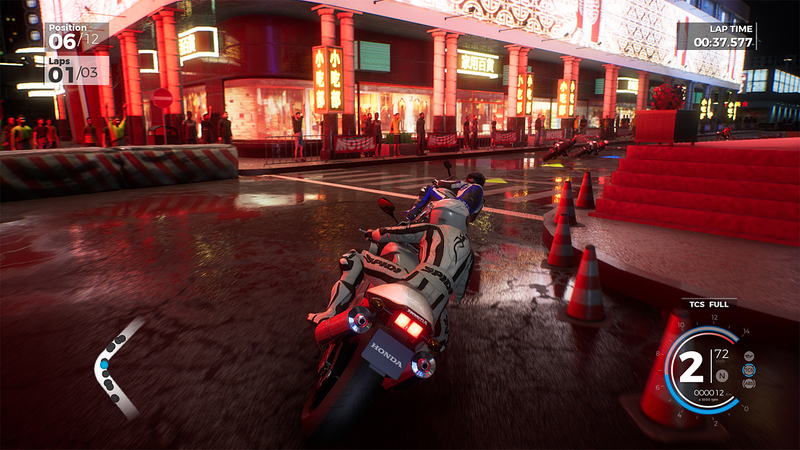 The jump to Unreal Engine 4 seems to have mostly helped with lighting and environmental details – the majority of tracks can now be played at night and the game’s rain effects are actually rather lovely. Ride 3 serves up 30 tracks, 12 of which are new to the series. These range from classic GP circuits like Brands Hatch and Nürburgring, to the Daytona International Speedway, to a twisty, neon-lit Macau street racing gauntlet. Again, the tracks can be a touch sterile, but there’s a nice variety of them, and the real-life ones have been recreated with impressive attention to detail. The goal of Ride 3 is pretty straightforward – collect lots of bikes. The game ships with over 230 of them, 70 of which are making their Ride series debut. Nearly 30 manufacturers are represented, including standard names like Honda and Suzuki, as well as companies that may be more familiar to Euro racing fans, like Aprilia and Triumph. You certainly can’t accuse Ride 3 of a lack of variety when it comes to bikes. Of course, all of your rides can be customized, which is a fairly straightforward process. Buy the more expensive parts and your bike will go faster and handle better. As mentioned, a livery editor has also been added, which provides a fair amount of depth – each design can have up to 1000 layers – although the interface leaves something to be desired. The best way to collect bikes is to play through the Career mode, which is now divided up into a series of “Volumes.” Each of these Volumes, stylized as retro racing magazines, have a specific focus – you may, for instance, be restricted to electric or 80s Japanese two-stroke bikes (don’t worry, most Volumes aren’t quite so narrow in their scope). These Volumes unlock in tiers, 9 at a time, and can be tackled in whatever order you choose, giving the player more leeway in how they progress through their career than past Ride games. That said, Career mode still starts to feel repetitive after a while. Milestone tries to dress it up, but you’re still repeating a very simple “race, buy bike, race, buy bike” loop. If you’re not a huge motorcycle fan, if the prospect of unlocking a shiny new set of wheels doesn’t thrill you, Career mode will become a grind. But hey, if you are a true fanatic, Ride 3 will give you plenty to chew on. Career mode consists of 61 Volumes, each of which takes at least an hour to finish, and there are Weekly Challenges to tackle. 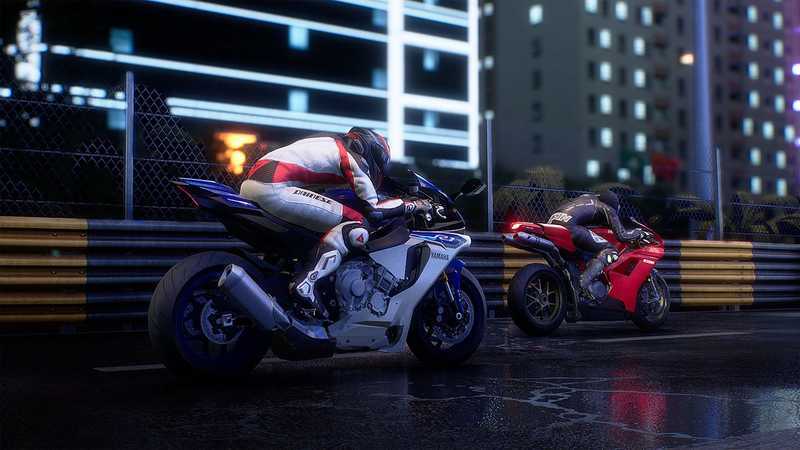 Ride 3 could be your asphalt addiction for some time to come. 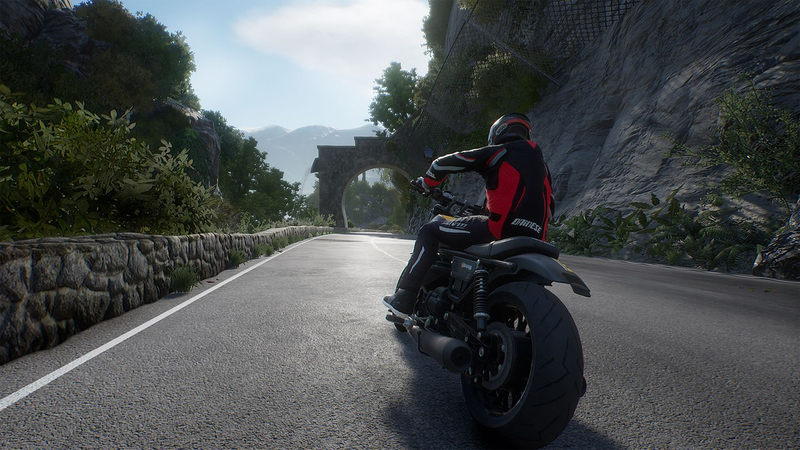 This review was based on a PS4 copy of Ride 3 provided by publisher Milestone.